It’s hard to believe that April the 15th will be the hundredth anniversary of the sinking of the Titanic. 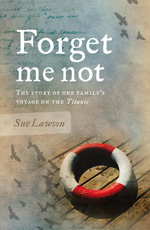 Sue Lawson has marked the event with the release of her latest novel for young readers, Forget me not. It’s a book that should appeal both to those who are familiar with the Titanic’s story and those with little knowledge of the tragedy. In it, Lawson tells the tale of one family’s experiences on board the ship, from the beginning of their journey to the events of the sinking and its immediate aftermath. Forget me not focusses on Thomas and Eve, brother and sister, with chapters alternating between their perspectives. While Eve’s chapters are written in first person, Thomas’s are in third, which is an unusual technique that didn’t entirely work for me as a reader. 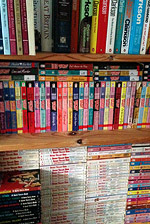 I can guess at Lawson’s reasoning behind this stylistic choice – and did guess at it from the beginning of the novel, which rather muted the ending for me – but the change tended to bring me out of the text a little and I probably would have found the reading experience a little smoother if both perspectives had been related in the third person. Apart from this small matter of personal taste, I thought that Eve and Thomas were well chosen as the co-protagonists of Forget me not. They allow readers to view life on board the Titanic from the perspectives of both male and female passengers – a fact that becomes particularly important once the boat begins to sink and it is the women and children who receive priority access to the lifeboats. Thomas is on the verge of adulthood and his frustration with not being treated as the man he wishes to be is well portrayed. Similarly, Lawson does a good job of presenting the conflict between Eve’s wishes for herself and her mother’s opinions of what constitutes proper behaviour for a girl or woman in the 1910s. I particularly enjoyed Hugh as a secondary character. Like Thomas, he’s on the line between childhood and adulthood and, as such, he can be a little changeable when it comes to his interactions with Thomas and Eve. He’s always kind and reliable where needed, though, which should make him a favourite with a lot of readers. Thomas and Eve’s father is also an extremely likeable character – possibly even my own favourite. In contrast, it is a lot more difficult to appreciate their mother, even if the reader later learns to be sympathetic as to why she is the way she is. Forget me not is a little slow-moving for the first half of the book, but this rapidly changes once the Titanic hits the fatal iceberg. Lawson has a talent for making her action both exciting and emotive, which is an excellent skill to have when dealing with real life disaster in a fictional frame. I think it would be extremely difficult for a reader to set down the novel once it reaches the point of the Titanic’s impact with the iceberg, so engrossing is the narrative in the latter part of the text. Forget me not is a solid historical novel for younger readers, which should help to spark an interest in the real life events that it is based upon. It should particularly appeal to readers at an upper primary or lower secondary level, but the story of the Titanic is so timeless that older readers should find a lot to appreciate as well. I have a guest post live on the Matterpress Blog today: a few words about the nature of compression in fiction.